Ms. Miles' Math Site | Helping students succeed in math. Helping students succeed in math. We are excited about this school year! Mrs. Thomas and Ms. Miles are looking forward to meeting you and have been making preparations for you! We have an exciting journey planned in Algebra 1 and are so glad you will be joining our team! Click on the image of the syllabus to find out what to expect in Algebra 1 Project Success. What are the similarities and differences between traditional and flipped learning? What do I need to know about schoology? How can an interactive student notebook help me succeed? How can are principles of gaming infused into this course? Flipped Classrooms will increase teacher/ student time. Flipped Classrooms help the parent help the child. Flipped Learning decreases the student’s anxiety over homework. Flipped Classrooms enable students to pause instruction and “rewind their teacher”. Flipped Instruction will lead students to deeper learning. What is an Interactive Student Notebook? Click on the picture to learn more about Interactive Student Notebooks. Special thanks to Sarah Rubin of EverybodyIsaGenius blog for sharing her prezi. Where do topics pertaining to the History of Mathematics fit in our mathematics frameworks? The Fibonacci sequence is a concept rich in problem solving potential and real world application, that too few teachers are aware of. This post will offer some practice and content connections for the Fibonacci sequence, and will include directions for one of my favorite designs, the Fibonacci Quilt. I recorded a background of the Fibonacci Sequence, which I show students. When we provide “low threshold, high ceiling” problems for students to solve, they learn to “make sense of problems and persevere in solving them.” (Math Practice 1). Besides the rabbit problem, there is an interesting science application that produces the Fibonacci numbers. It is found in the family tree of a male bee. Turns out, a female bee has two parents: a male and a female, but a male bee has only one parent: a female. When you trace the genealogy of a male bee backwards, the Fibonacci numbers will be revealed. Ratios and proportions are topics that are foundational to algebra. Beginning in grade 6, students connect ratio and rate to multiplication and division. In grade 7, students solve multi step problems involving ratios, rate, proportion and percent. Grade 7 students recognize proportional relationships from context, equations, tables and graphs. In grade 8, students deepen their knowledge of proportional relationships and explore functions. In high school mathematics, students solve problems involving trigonometric ratios and rate of change. A ratio is a comparison of two numbers. The so-called Golden Ratio can be found throughout nature. The golden ratio, or the ratio of the length to the width of a golden rectangle, can be found in the nautilus shell, in art, architecture, and faces like Mona Lisa that are considered beautiful to behold. 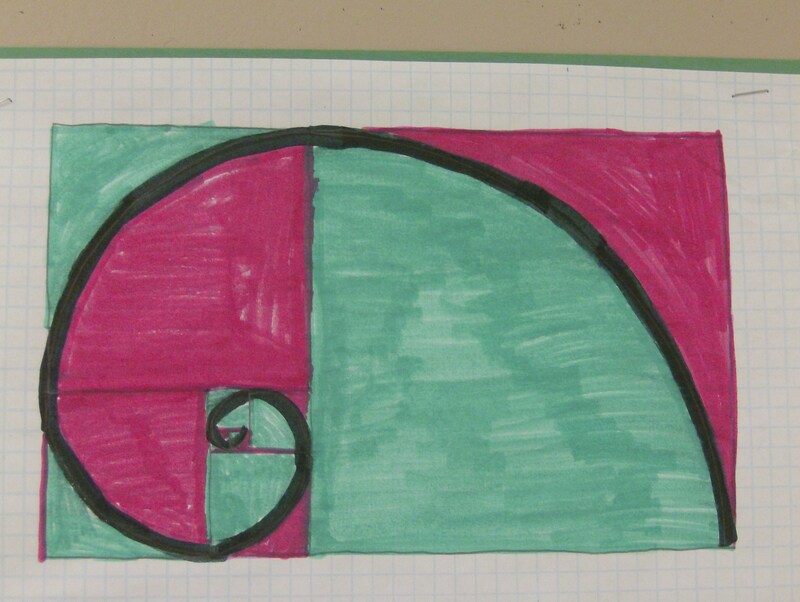 Besides being found in nature, beautiful designs can be constructed using the Fibonacci numbers. The Fibonacci spiral can be constructed using graph paper, a straight edge and a compass. Mathsisfun.com provides directions and information on the Fibonacci spiral. One of my students made the spiral you see below. 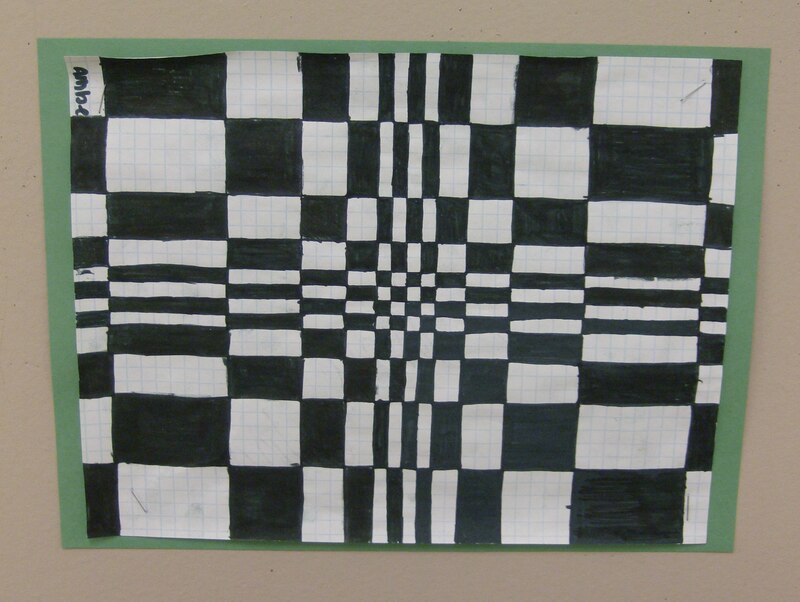 Use a sheet of graph paper and divide it into four quadrants. Start in the first quadrant. On the very first row of squares above the “positive x-axis”, make rectangles of height 1, using two alternating colors with widths 1, 1, 2, 3, 5, 8. Then, above that row, using alternating colors, make another row of rectangles, still of height 1, with widths 1, 1, 2, 3, 5, 8. Above that row, make another row of rectangles of height 2, with widths 1, 1, 2, 3, 5, 8. Above that row, make another row of rectangles with height 3, with widths 1, 1, 2, 3, 5, 8. Continue changing the height of new rows of rectangles according to the Fibonacci numbers and complete Quadrant I. Now move onto Quadrant II. Consider rotating the paper so that Quadrant II is in the position where Quadrant I was. Follow the same directions for Quadrant II as you did for Quadrant I. 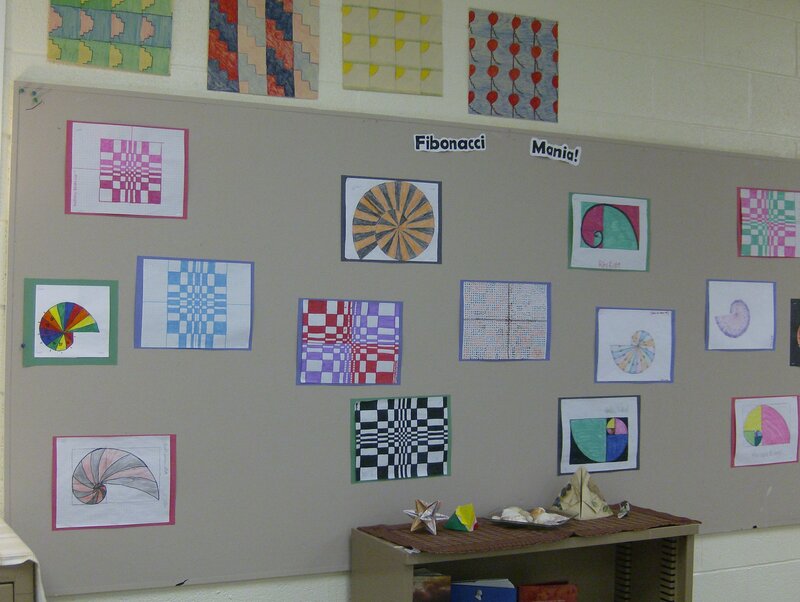 Do the same for Quadrants III and IV and you have completed your Fibonacci Quilt! Voi-la! Incidentally, I have a friend who is a jeweler. His wife is a math teacher. He has created a beautiful pendant of the Golden Spiral. You can view his pendant on his etsy.com page. A must-view Tedtalk summary video of the Fibonacci numbers can be found below. We are looking very forward to your arrival in late August. We trust you will enjoy being part of our Freshmen Academy. The purpose of the Academy is to acclimate you to high school life and academics. Solve Fibonacci’s Rabbit Problem to discover the famous Fibonacci sequence! 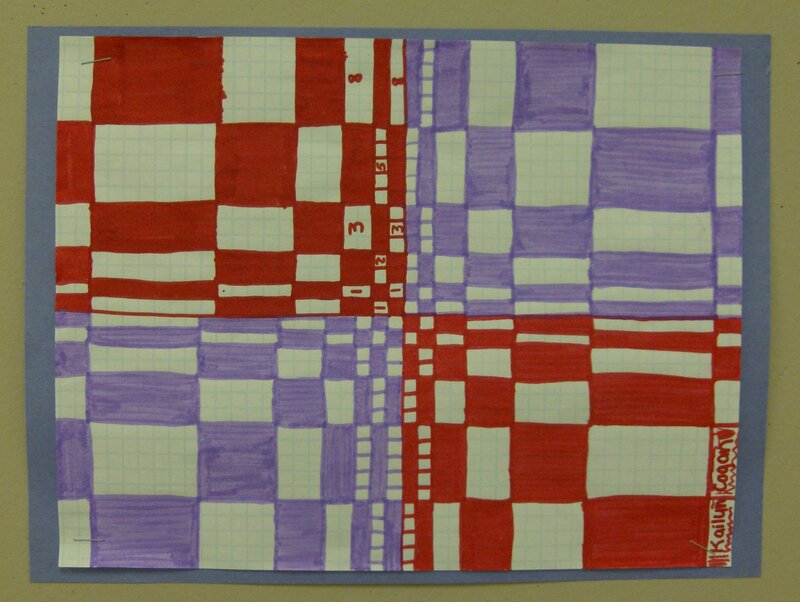 Can you see the sequence of numbers in the beautiful design below?